The National Service Scheme (NSS) was officially started on 24th September 1969, to establish a meaningful linkage between the campus and the community. Mahatma Gandhi, the Father of the Nation, had recognised that the country could not progress in a desired direction until the student youth were motivated to work for the upliftment of the villages/community. For Gandhiji, the villages, where majority of the population living, represent the country. Therefore for the national reconstruction and national resurgence it was deemed fit that the students and teachers should be properly sensitised and utilised for strengthening the Indian society as a whole with particular emphasis on rural community. Therefore, student youth, teachers and the community are considered as the three basic components of the National Service Scheme. The National Service Scheme has been functioning with the motto "NOT ME BUT YOU" in view of making the youth inspired in service of the people and hence NSS Aims Education through Community Service and Community Service through Education. The N.S.S units Unit – I, Unit – II, & Unit – III of our college functions under the guidance of three coordinators namely S.SAVITHRI, R.SARALA and M.ANUSUYA. We have organized and also taken part in the various programmes conducted by different organization in and around Tamil Nadu. 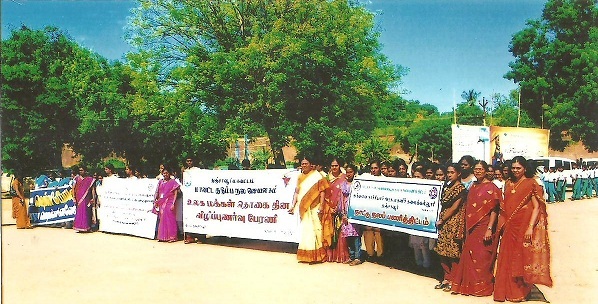 On July 11, 2009 an Awareness Rally on World Population Day was organized by District Family Welfare Society, Thanjavur. On August 15, 2009 our N.S.S students have celebrated Independence Day in their adopted village Punnainalur, Thanjavur. On 24th September, 40th N.S.S Day was celebrated in our college. On October 7th, 2009 the N.S.S students underwent Leadership Quality Programme. On December 18th, 2009 our students took part in Self Defensive Mechanism Progamme. National Service Scheme Special Camp was conducted by our college from January 25th to January 31st 2009. The N.S.S units Units (Unit – I, Unit – II, & Unit – III) of our college functions under the guidance of three coordinator namely S.AMUDHA, S.K.VENNILA, and M.ANUSUYA. On June 10th 2010, an Aware Rally on 'Ulaga Tamizh Semmozhi' was organized by our N.S.S unit. An Awareness Rally on 'World Populaiton' was held at July 11th , 2010. On August 12th, 2010 an Awareness programme on Breast Feeding was organized by the Inner wheel Rotary Club and a team of doctors. We observed Sadbhavane Diwar and celebrated International Youth Day on August 20th, 2010. On September 20 – 22, Vasan Eye Care Hospital Conducted a Free Eye Care Hospital Conducted a Free Eye Screening Test for our Students, and staff of our college. The Leprosy Eradication Awareness Programme was conducted on 11.10.2010. An Awareness Rally on Aforestation was organized by Esha Yoga on 22.10.2010. On December 20th, 2010 an Awareness Programme on Energy Conservation was conducted by TNEB and N.S.S of our college. Lions Club and N.S.S of our college jointly conducted a seminar on Global Warming on December 29th, 2010. N.S.S Special Camp was conducted by our college on Nilagiri Panchayat Union, Manojipatti, Thanjavur. On 11th February 2011, RRC with NSS of our college conducted a programme on prevention is better than cure. Our college have celebrated service day on March 8th, 2010. Unit – I : Dr.S.AMUDHA, Tamil Dept. Unit – II : S.K.VENNILA, English Dept. Unit – III : M.ANUSUYA, Mathematics Dept. On May 21st, 2011, Our Students Observed Anti-Terrorist Day. On July 11th, 2011, our Students went a rally on World Population on August 7th, 2011. Our Students have participated in Menstrual Hygiene Programme in BARD. On September 24th 2011, our students have celebrated N.S.S day. On October 1st 2011, our students have participated in Blood Donation Awareness Programme. On December 1st 2011, Our students took part in AIDS Awareness Rally on January 24th 2011, Many competitions were conducted to the students for Voters Day. On February 13 – 19, N.S.S Special Camp was conducted in Manojipatti (Unit – I), Rahman Nagar (Unit – III) & in March Upparigai Manojipatti (Unit – II).